and the pink trailer is hard to miss! Downtown Sallisaw will sizzle this weekend as the Hot Pickin’ Finger Lickin’ BBQ Contest and Band Fest gets underway. Lots of activities are planned for the two-day event this Friday and Saturday, sponsored by Sallisaw Main Street and the Sallisaw Chamber of Commerce. 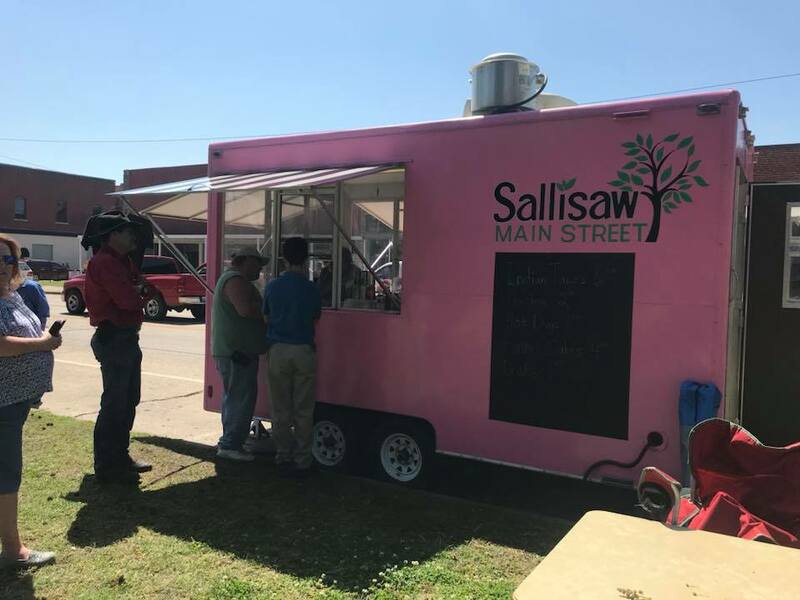 She said Sallisaw Main Street will be out with their food truck serving their famous Indian tacos, along with funnel cakes beginning at 10 a.m. Friday, and more food will be available later with live music from the HiFi Hillbillies at 7 p.m. Friday. Chamber Director Marty Green said several vendors will have pop-up shops with items ranging from food to lawn and garden items for sale starting at 9 a.m. Saturday on the library lawn. At 11 a.m. Saturday, Henson said taster kits will be available for $10 per person, including a drink. Dirt Road Therapy will provide live music on Saturday. Organizers encourage everyone to come hungry on Saturday and vote for your favorite barbecue in the popular People’s Choice Award. 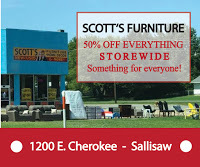 For information, contact Sallisaw Main Street at 918-776-7920 or the Sallisaw Chamber at 918-775-2558. 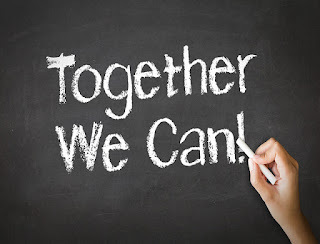 Saturday, April 27, the Sequoyah County Child Abuse Task Force/Children's Advocacy center will be collaborating with the Sallisaw Special Victims Unit, Sequoyah County Community Response Team, and Cherokee Nation CCR for a first time event called "Together We Can". This event will be for Victim's Rights Week, Child Abuse Prevention Month, and Sexual Assault Awareness Month." 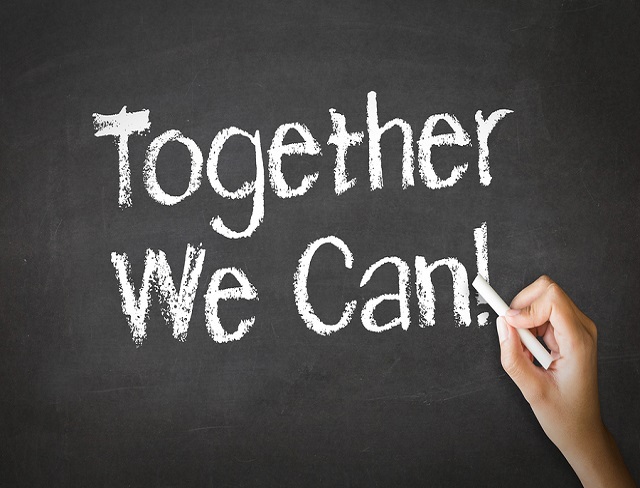 "Together We Can" will be held from 11 am until 1 pm. at the Sallisaw Fire Dept. We will be handing out free hot dogs, chips, and drinks," stated Donna Owens. "There will be several agencies on hand with resources available." Owens is a MDT Coordinator/Forensic Interviewer with the Children's Safehaven Advocacy Center. The event promises lots of fun including a bouncy house for children, and lots of goodies to be given away. Voters in Sequoyah County who want to have absentee ballots mailed to them for the May 14th OG&E Franchise for Gore Municipal should apply now, County Election Board Secretary Cindy Osborn said today. Although the County Election Board can accept applications for absentee ballots until 5 p.m. on Wednesday, May 8th, Osborn urged voters who want to vote by absentee ballot to apply early. 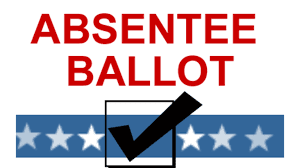 Absentee ballot application forms are available at the County Election Board office located at 110 E Creek St Sallisaw Ok 74955. An online version of the form can be filled out and submitted electronically at: www.elections.ok.gov. A print form can also be downloaded at that address. Osborn said any registered voter may vote by absentee ballot in any election in which he/she is eligible to vote. However, a voter must be registered and reside at an address within the geographical boundaries of a school district or a municipality to be eligible to vote in school district or municipal elections. It is not necessary to give a reason for voting absentee. A Fort Smith man appeared in a Cherokee county courtroom last Thursday regarding first-degree murder charges. Ricky Don Rainwater, Jr., 44, entered a not guilty plea before District Judge Douglas Kirkley on two counts, including first-degree murder and robbery by force or fear. 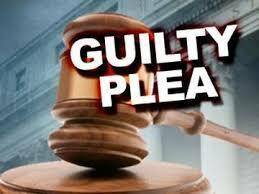 A third count, larceny of an automobile, has been dropped, according to court records. Rainwater, according to reports, has confessed to choking to death Larry Lane Sr., father of Sequoyah County Sheriff Larry Lane Jr., on Aug. 31 at Lane’s home in Park Hill in Cherokee County. He then allegedly stole some of Lane’s belongings and fled out of state. 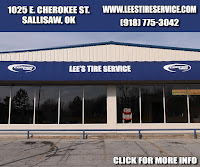 Rainwater was arrested by Memphis police after Cherokee County, Sequoyah County and OSBI investigators tracked receipts from Lane’s stolen credit card across two states. Lane’s stolen pickup truck was discovered in West Memphis, Ark., and officers found Rainwater in a mental health facility where he had admitted himself, according to Jack Thorp, District 27 District Attorney. Crystal Jackson of Tahlequah, Rainwater’s attorney of record, has 30 days to file motions. His next court appearance is scheduled for May 30. 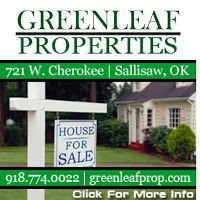 Administrators, teachers and students are excited Sallisaw High School will soon unveil its newest offering to students. Crews are currently working on renovating a traditional classroom into a concurrent classroom with Zoom technology on the Sallisaw High School campus that will allow college instructors from Carl Albert State College to conduct classes on the high school campus, according to Brad Jackson, SHS assistant principal. Sallisaw Superintendent Jeremy Jackson said students walking into the new classroom will feel like they are walking into a college classroom. “We want it to be something they still have a desire to come in here, like they’re stepping onto a college campus somewhere,” Jeremy Jackson said. Larger desktops and swivel seating on carpeted, stadium-type riser seating, along with surround-sound, television cameras with the Zoom technology, which allows for video conferencing, and a larger video screen will add to the collegiate atmosphere. 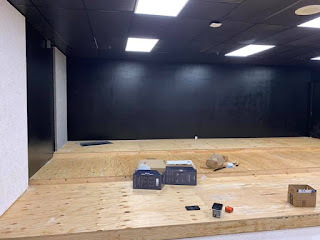 The partnership with CASC will be evident, as Black Diamond graphics will cover one wall and Viking graphics will adorn another. Brad Jackson explained that Sallisaw will use the classroom as a hub for other students throughout the county to also take advantage of the concurrent instruction. College instructors from CASC will be face-to-face in the Sallisaw High School classroom and be able to “zoom” into other school classrooms throughout the county, such as Muldrow, Roland and Vian. SHS administrators have been working with Dr. Bill Nowlin, dean of enrollment management at CASC, on the county-wide partnership, that also includes a grant from the Cherokee Nation. Leflore County schools are also involved. Currently, between 80 and 110 SHS students are taking concurrent classes, depending on ACT scores. That number could reach 300-400 students when factoring in students from other Sequoyah County high schools. This fall, the concurrent classes offered through the Zoom-technology classroom include math, English, science and U.S. government. Sallisaw currently has one teacher dually certified to teach concurrent classes, with two more in process of dual certification. Students must be a junior at SHS to participate in the concurrent classes. School counselors working with college advisors have assisted students interested in or taking the concurrent classes with schedules focused on their career study path. “We have seniors who will be leaving the building with 30 hours of college credit,” explained Jeremy Jackson, adding that those are hours they received tuition-free, but do have to pay for books and fees. Brad Jackson said the concurrent classroom will also help with those students unable to drive. The U.S. Attorney’s Office for the Eastern District of Oklahoma announced that Carlos Francisco Lainez, age 34, of Las Vegas, Nevada entered a guilty plea to Possession With Intent To Distribute Methamphetamine, punishable by not less than 10 years and not more than life imprisonment, up to a $10,000,000.00 fine or both. The Indictment alleges that on or about February 3, 2019, within the Eastern District of Oklahoma, the defendant, did knowingly and intentionally possess with intent to distribute 500 grams or more of a mixture or substance containing a detectable amount of methamphetamine, a Schedule II controlled substance. The charges arose from an investigation by the Sequoyah County Sheriff’s Office and the Drug Enforcement Administration. Assistant U.S. Attorney Shannon Henson represented the United States. Brushy Public School received a $13,500 grant from the TSET Healthy Incentive Program for Schools. Pictured are, from left, Kim Netz, Heather Silva, Sharon Howard, Shannon Edwards, Brushy Superintendentl Greg Reynolds and Lindsie Dyer. 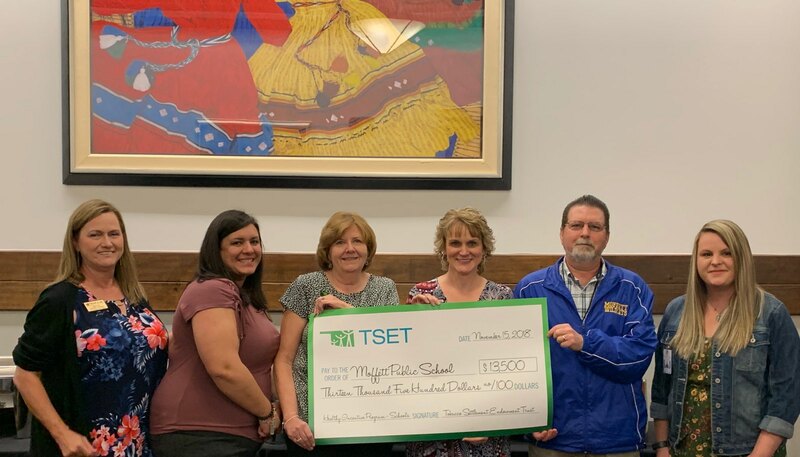 Moffett Public School received a $13,500 grant from the TSET Healthy Incentive Program for Schools. Pictured are, from left, Kim Netz, Heather Silva, Sharon Howard, Shannon Edwards, Moffett Principal Lance Stuart and Lindsie Dyer. 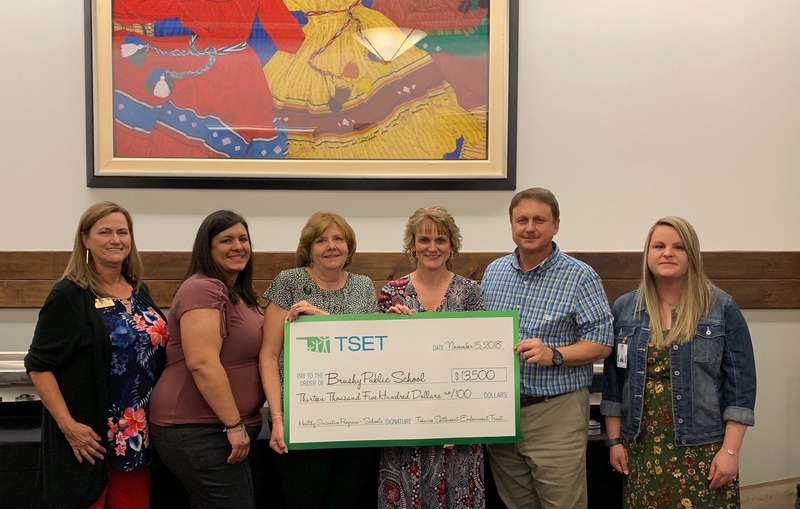 Two Sequoyah County Public School districts were honored recently for their efforts to improve health through the Tobacco Settlement Endowment Trust (TSET) Healthy Incentive Program for Schools. Brushy Public Schools received a $13,500 grant and are using the funds to purchase an automatic external defibrillator (AED), health assessment equipment, CPR equipment, PE and playground equipment, nutrition newsletter for parents, and staff training on integrating physical activity. Moffett Public Schools also received a $13,500 and are using the funds to purchase an automated external defibrillator (AED), CPR equipment, health assessment equipment, PE and playground equipment, archery equipment, staff development training, nutrition education items and parent education. 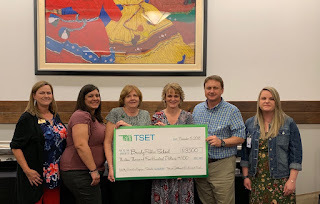 Sharon Howard, TSET healthy incentive program manager for schools, as well as Shannon Edwards, school nurse for both Brushy and Moffett schools, and representatives from the TSET Healthy Living Program serving Sequoyah County, including Program Director Lindsie Dyer, Wellness Coordinator Heather Silva, and Program Coordinator Kim Netz – were on hand for the presentation. The Sequoyah County grantee is People, Inc. The incentive grant criteria focus on strengthening district wellness policies to improve school nutrition, increase physical activity, student wellbeing and provide tobacco-free environments for students, staff, faculty and families. These health-promoting practices and policies are recommended by the Centers for Disease Control and Prevention (CDC). Incentive grant funds must be used for projects or programs to improve health. 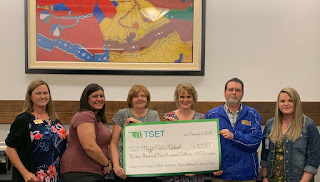 Funds for the TSET Healthy Incentive Program are limited and all available funds have been exhausted for this fiscal year. Grant applications will not be accepted for the remainder of this fiscal year, which ends June 30. The grant program is expected to re-open for the next fiscal year. The TSET Board of Directors has awarded grants to 54 school districts and school sites and 33 communities. Over $1.9 million in grants have been provided to promote partnerships at the local level to improve health and promote healthy behaviors in schools and communities.